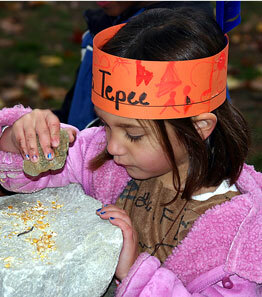 The annual Native American Day was the culminating activity to a unit that focused on American Indians at Trinity School, Ellicott City, Nov. 19. Clad in traditional Indian dress with tribal symbols painted on their faces, two kindergarten classes sang songs around a teepee on the school’s spacious campus and played tom-toms they handcrafted. The “Indians” rotated through six learning stations with several activities in each: the cranberry center, hunt center, fishing center, corn center, teepee center, and basket weaving center. Students fished in a real stream for plastic cut-out “salmon,” went to the bog for cranberries to make cranberry relish and made Indian pinch pots out of clay. The highlight of the day was “hunting for buffalo” with decorated sticks then feasting on the catch (hot dogs).